One of the many pieces of evidence put forward for the existence of Planet X over the last few decades is the so-called 'Pioneer anomaly'. The two Pioneer spacecraft were sent on an incredible voyage across the solar system, visiting a number of planets as they went. They not only imaged these planets, but used the gravity of the planets to accelerate onwards, deeper into the solar system. 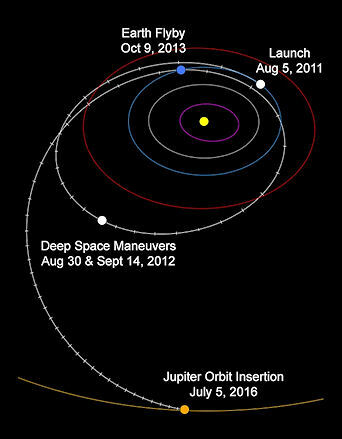 This gravity assist is often used to allow spacecrafts to pick up speed. As the Pioneer probes travelled across the outer planetary zone and on towards the Heliopause beyond in the 1990s, it became apparent that the craft were not moving away from the solar system quite as quickly as the theoretical trajectory projections demanded. Something was essentially slowing them down. Additionally, similar effects were noted for the Galileo and Ulysses probes. I was intrigued by two possibilities. 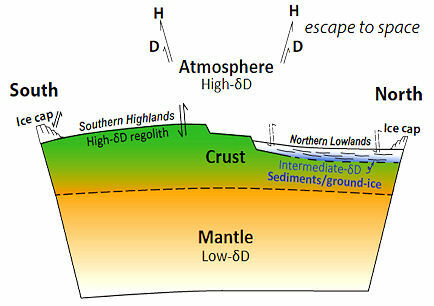 The first is that the gravitational tug experienced by these spacecraft is ever so slightly affected by a non-uniform cross-section of the planet. In other words, the Earth might provide a slightly variation in gravitational attraction, local to a spacecraft flying over it, depending upon whether the interior mass of our planet is slightly offset - or, at least, has areas of high interior density which are not uniformly distributed. While I could see this being a possibility for a rocky planet like Earth, with its diversity of internal composition and layers and overall non-spherical 'geoid' shaping, it's more difficult to see how that might be the case for a gas giant, like Jupiter, whose interior would surely be more uniformly distributed. 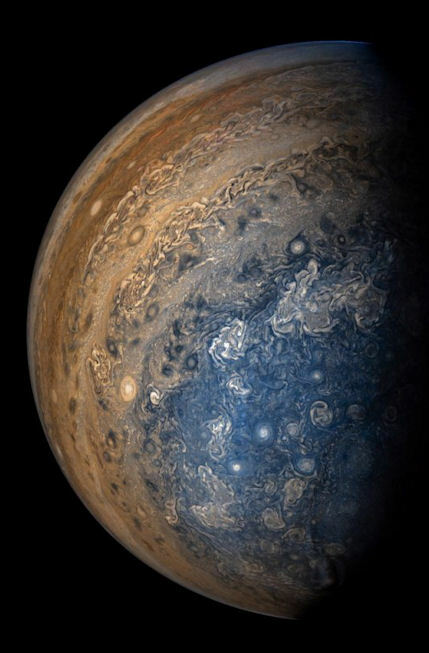 Indeed, the team studying the trajectories of Juno's polar orbits of Jupiter accounted for Jupiter’s multipolar fields, which are the result of the planet's oblate shape. (1) Could these anomalous accelerations be due to a non-uniform planetary interior creating slight gravitational differences affecting the craft during a flyby? (2) Do these anomalies show up more with polar flybys ... or, at least, flybys which are not sticking to the ecliptic plane? These probes which have exited the solar system offer so much beyond the glorious array of images they sent back during their main missions. In the case of Pioneer, questions were raised (and seemingly continue to be raised) about fundamental physics. 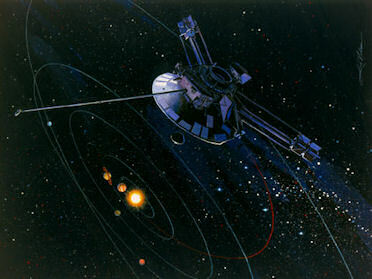 The tenacity of the Voyagers can be seen through their ability to respond to new thruster demands decades after these systems went into hibernation, potentially extending their missions even further (14). Finally, after its flyby of Pluto and Charon, the New Horizons probe is set to approach the Kuiper Belt Object known as 2014 MU69 late next year, making its flyby on 1st January 2019. Originally thought to be about 20 miles across, recent attempts to analyse the size of 2014 MU69 as it passed in front of a background star proved difficult. Although detected by several groups of astronomers during this transit, 2014 MU69 appears to either much smaller than originally thought, or could be a binary object, or even a swarm of smaller objects (53). These exiles from our solar system continue to surprise. We're used to the concept of holes in the ozone layer on our own planet. But it may be far worse on planets orbiting red or brown dwarf stars. potentially habitable planets orbiting these stars may be located so close to their parent stars that they are tidally locked, causing the same face of the planet to forever gaze upon the star. This is the same effect as our Moon facing the Earth - the lunar rotation matches its orbital period around the Earth. But in the case of a planet orbiting a small dwarf star, this has implications for the way any light and radiation arrives at the planet. Without a rotation of its surface relative to the star, the same hemisphere of the planet will face the star. One side of the planet in is continual daylight, one night. This would like cause extremes of climate across the globe, tempered by atmospheric movement. That said, this also potentially sets up a very different meteorological system on the exoplanet. New modelling of stratospheric circulation of Earth-like exoplanets orbiting dwarf stars, particularly in less than 25 days, indicates that ozone, in particular, may be distributed very unevenly across the surface of the world. In the case of photochemically produced gases, like ozone, these may be confined to an equatorial transport belt, and may never get distributed into the polar regions of the planet at all (1). "Modelling the flow of air within the atmospheres of these planets, [Ludmila] Carone [of the Max Planck Institute for Astronomy in Germany] and her colleagues found that this unusual day-night divide can have a marked effect on the distribution of ozone across the atmosphere: at least for these planets, the major air flow may lead from the poles to the equator, systematically trapping the ozone in the equatorial region. Carone says: "Absence of traces of ozone in future observations does not have to mean there is no oxygen at all. It might be found in different places than on Earth, or it might be very well hidden." The ultraviolet output of brown dwarfs is less well known - these objects are much more difficult to detect and study than their larger red dwarf cousins. On the plus side, the absence of UV could be seen as a good thing for habitability, as too great an exposure to this form of radiation is harmful to life. On the other hand, UV drives chemical and biochemical processes, so is definitely welcome in small measures. 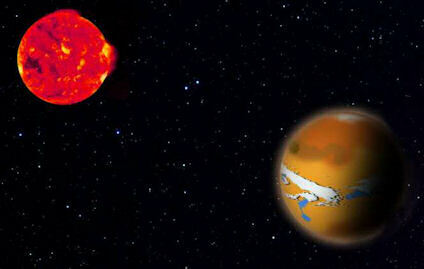 It may be that in the case of red dwarfs, the combination of tidal locking and UV flaring is a dangerous combination. This may contrast with brown dwarfs, which could have a much milder exposure to UV, undaunted then by the tidally-locking effect. We simply don't know at this stage. The potential viability of Mars as a habitat for humans involves a great many difficult challenges. Climate, air composition, resources, to name just a few. The ability to grow food using the Martian soil, or regolith, is one potential issue. Although the mineral constituents of the Martian soil are less sharp and rough than those found on the Moon, they are still sharper than those generally found in soil on Earth (1). Mars, after all, experiences weather, with dust storms in particular creating weathering effects upon the surface regolith. Also, mars had a watery past, which would also have contributed towards surface erosion, and a softening up of these minerals. Which raises the question - could Martian soil offer a viable basis for creating an ecosystem within which to grow food? Worms play an important role in processing soil constituents. They swallow soil, passing the mineral components safely through their guts. But if the soil constituents are too sharp, then this natural process will endanger their life. Researchers have simulated Martian regolith in laboratory experiements, mixing it with manure for a bit more vitality. The introduced worms into this 'alien' environment to see how the blighters got on. Well, it turned out, with the worms managing to reproduce quite happily (2). This is, of course, very different from saying worms could survive on Mars, undaunted by the challenging environment of that planet. Apart from the very different atmospheric conditions, the lack of surface water and the extreme cold, there is no strong evidence of life having a foothold on Mars. If life's there at all, it's likely to be hidden under the surface, which makes worms a more likely denizen than most other possible species of Martian lifeforms (3). After all, Mars may have sub-surface icy lakes and/or oceans hidden under the regolith, like those on Jupiter's Galilean moons Europa and Ganymede (4). 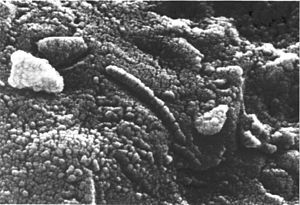 Then there's the question of the fossilised wormlike-microorganisms thought to be a feature of Martian meteorite ALH84001 found in Antarctica, which were excitedly announced as a sign of alien life by NASA scientists in 1996 (5). This evidence for Martian microbial life remains contentious. Whether true or not, these nanobacteria are orders of magnitude smaller than the kinds of worms featuring in the biology experiments within regolith-like soil. This may be a bit of an exaggeration, as the types of compounds generally found in the dust lie on the organic end of the organic/biochemical spectrum, albeit likely in the form of large macromolecular compounds. The research also indicates that this carbon-rich material is dry - the water element of the comet, although present, is wrapped up as ice, precluding chemical interaction with the carbon-rich elements. Like the contents of a food freezer, they are separate, but stored together. There does not appear to have been much water-based chemistry going on within the comet. Nonetheless, the carbon-rich nature of this ancient cometary material raises the prospect that the organic macromolecular building blocks of life were indeed delivered to the Earth (2) - and to all other planets in the solar system, too. All that's needed in those environments is the presence of liquid water to really get things going. In October's Dark Star blog, I wrote about the first confirmed interstellar visitor to our solar system, known at that point as A/2017 U1 (1). The object, which had a reddish tinge to it, had proceeded through the solar system at quite a gallop. It failed to outgas a cometary tail, despite its precarious perihelion passage, which led astronomers to re-label the visitor as an asteroid rather than a comet. This inert nature is unusual, to say the least, and raised many questions. But astronomers had precious little time to examine this object in any great detail, its hyperbolic procession through the planetary zone being so transient. In addition to its reddish tinge, and lack of outgassing, the object notably exhibited a highly unusual variation in luminosity, allowing astronomers to deduce that this curious object has a rather odd shape. 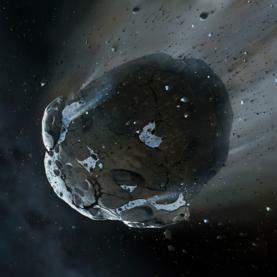 It appears as though the asteroid is shaped as a shard, and is tumbling head over heels on its axis every 7 hours or so. Looking at this artist's impression of the interstellar object, which has been formally re-named 1I/2017 U1 (I for interstellar) and given the Hawaiian handle 'Oumuamua by its Pan-STARRs discoverers (2), you could be forgiven for thinking it bears some resemblance to a Star Destroyer from Star Wars. (Although objects in space do not need to be aerodynamic, a thin needle-like shape minimises the number of potential high-velocity collisions with grains of interstellar dust). This shape is unlike anything seen before in the solar system. It's true that many asteroids are mis-shaped, but never of these elongated proportions. This has led to some speculation about the origins of this weird and wonderful shard or rock and metal, which originates from somewhere near Vega (coincident with the solar apex, or the interstellar destination of the Sun as it moves through space). One scientist considers 1I/`Oumuamua to be a fragment from a disintegrated planet - one that was rendered asunder by a dense member of a binary star system, like a red dwarf (3). Where the more familiar rounded rubble of our own solar system stems from collisional activity, the shard-like appearance of 1I/2017 U1 suggests a totally different origin - or at least the lack of cosmic 'weathering' in the interstellar environs it appears to have been tumbling through. It's hard to draw any firm conclusions from what little is known of this object, except that it is clearly very different from our familiar backyard comets and asteroids. One can understand the excitement, given the oddities of this object. Its hyperbolic trajectory for the solar apex, its cartwheeling spin, its shape, its lack of outgassing volatiles: All very unusual. This first known interstellar object also bears a little resemblance to the eponymous vessel in Arthur C. Clarke's novel 'Rendezvous with Rama' (6) - the fictitious visiting spacecraft which is initially considered to be an asteroid by astronomers. The scale is very different, though - 'Oumuamua's length is hundreds of meters, compared with Rama's 34 miles. In the end, somewhat predictably, the elongated asteroid failed to display any signs of overt artificial intelligence (7). In a way, this question of alien presence served as a distraction from the real puzzle here - how did this interstellar asteroid get this weird shape? As yet, there is no definitive answer to this glaring issue. I had a particularly vivid dream last night, set in a scholarly environment - probably a college. 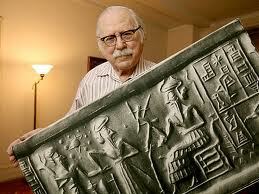 The dream featured Zecharia Sitchin, playing the role of a visiting professor. I'd written a paper and was musing over its contents, and how best to present it. Sitchin seemed critical, insofar as I could tell his reaction at all. I guess whatever I was doing seemed a peripheral concern. This might sum up my whole Dark Star enterprise. Sitchin, now passed, was not a huge fan of what I was trying to present. Anyhow, as time has gone on, I've maintained an active interest in Planet X/Nibiru (writing this monthly blog, and slowly compiling a new book), but tended towards the science side of things - perhaps even more than I had ten or twenty years ago - especially with the astrophysics etc. I remain hopeful that this object will one day be found, and be found to have a solid basis in everyday science. Sitchin was always interested in science, particularly when the technical prowess of the ancient civilisations of Mesopotamia were brought to light. He argued, passionately, that their myths, when read literally, exposed a deeply scientific appreciation for the composition and history of the solar system, more or less as we understand it now (he argues our current knowledge misses an important element which the ancients describe in some detail). In that vein, any indication of advanced Mesopotamian scientific understanding provided grist to his mill. 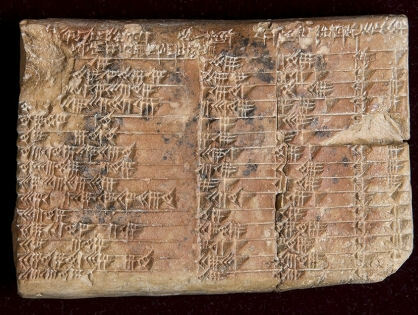 And so it is, then, that the Babylonians appear to have mastered an important branch of geometry, hidden within their complex mathematical sexagessimal system. Their knowledge of trigonometry appears to have pre-dated the Greeks by about 1500 years (1). Again, these claims are vigorously contested (2). But I think Sitchin would be smiling wryly at these developments in ancient Near Eastern studies (and maths? ).